Cult film actors Julie Benz, she of Dexter, Punisher: War Zone, Defiance and more, and Danielle Harris, the kid who once ran afoul of The Shape and is now one of the most beloved indie horror personalities alive, star in director Andrew C. Erin’s long-delayed Havenhurst, a terrifying new Gothic creeper that is set for release on February 10th in New York and LA with other markets to follow soon after. The title refers to a looming apartment complex in the heart of New York City’s historic Tudor City district. A beautifully maintained, turn-of-the-century building that houses over 3,000 residents… and countless dark secrets. The rent is what you can afford and the rules are simple: live a good and decent life and you can stay forever. Break the rules and… well, don’t break the rules, all right? Jackie (Benz), a troubled young woman with an unyielding alcohol addiction, is released from rehab and given a second chance with a new job and a furnished apartment at Havenhurst. Guilt-ridden over the tragic loss of her eight-year-old daughter, Jackie is quickly drawn into the mysteries of Havenhurst, in particular the unsolved disappearance of the apartment’s previous occupant, a young woman (Harris) she befriended in rehab who disappeared recently without a trace. Aided by a hardened New York police detective (Josh Stamberg) and a lonely foster child (Belle Shouse) who lives under the shadow of her caretakers’ sadistic whims, Jackie must not only battle her inner demons… but the very real ones that live deep within the walls of Havenhurst. 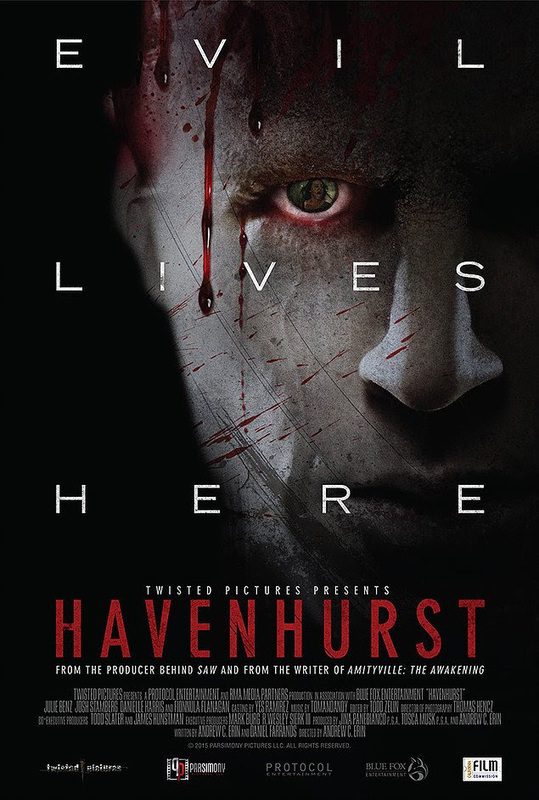 Havenhurst is written by Erin and Daniel Farrands (A Haunting in Connecticut) and is produced by Andrew C. Erin, Tosca Musk and Jina Panebianco. Cinematography is by Thomas Hencz. The movie also stars Fionnula Flannagan, Belle Shouse, Toby Huss, Matt Lasky and Douglas Tait. Havenhurst is a Twisted Pictures film and a Brainstorm Media release.